Juddha Bahadur Rai – Juddha started as a sherpa in 1994 and has been leading treks for over 6 years. He has done a number of Medical trainings with Dr. Jim Duff, Dr. Romeo Kansakar, Dr. Kulesh Thapa and Dr. Ross Anderson. He has led a number of private groups and also leads our challenging treks on the GHT Kanchenjunga, GHT Makalu & Everest Traverse, as well as in the Damodar Saribung region, Dolpo and Everest High Passes. He is a qualified trek leader and has completed a Basic Mountaineering Course from Himalayan Mountaineering Institute in India and World Expeditions Climbing Training with Soren Kruse Ledet. Bir Singh Gurung - Bir Singh is one of our senior and most versatile leaders from escorting private special interest groups and family treks in the Annapurna region, to leading groups along challenging sections of the Great Himalaya Trail, Everest Base Camp and our mountaineering expeditions on Mera and Island Peak. He is a very popular guide with all of the groups he is involved with. Bir started as a Sherpa guide and has been leading treks for the last 10 years. He has completed the entire 1600km of the Great Himalaya Trail and has been the Local Assistant for our Medical Trainings. Bir has also been instrumental in the organisation of our community projects at the Sanjiwani Health Clinic, an important medical facility in the lower Annapurnas, which has seen positive change thanks to our Community Project Travel program. 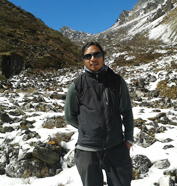 Bikash Rana is a Solu Khumbu Local and a well-experienced trek guide and climbing leader. He has been a guide with World Expeditions since 2002. He completed our wilderness medical trainings in August 2015 and has also completed a number of medical trainings previously with Dr. Jim Duff and KEEP. He has lead a number of private and school groups. Bal Bahadur Rana (aka Bal Ram) - Bal Ram previously led the GHT sections of Everest, Rolwaling and Langtang via Tilman Pass in 2014. He is our lead climbing guide and has done Medical Training several times, including the 2016 course at Ghibrang. Originally from Gorkha municipality, Bal Ram started as a porter and climbed up the ranks as a kitchen boy and then as a climbing sherpa. He did his mountaineering course in 1999 and became a Sirdar of mountaineering trips. He previously worked for Sea To Summit and in 2012 started leading World Expedition Mountaineering trips. He has summited many small peaks as well as major expeditions such as Baruntse and Pumori Peaks. 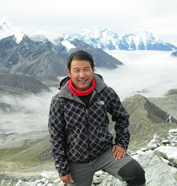 Juddha Bahadur Rai – Juddha started as a sherpa in 1994 and has been leading treks for over 6 years. He has done a number of Medical trainings with Dr. Jim Duff, Dr. Romeo Kansakar, Dr. Kulesh Thapa and Dr. Ross Anderson. He has led a number of private groups and also leads our challenging treks on the GHT Kanchenjunga, GHT Makalu & Everest Traverse, as well as in the Damodar Saribung region, Dolpo and Everest High Passes. He is a qualified trek leader and has completed a Basic Mountaineering Course from Himalayan Mountaineering Institute in India and World Expeditions Climbing Training with Soren Kruse Ladet.